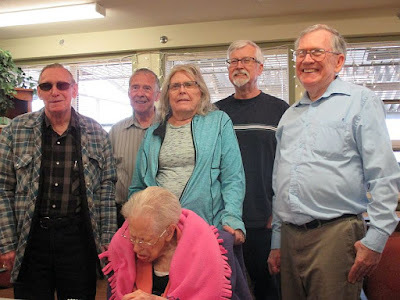 Bill's Genealogy Blog: Happy 98th Birthday Mom! Will the Real James Wright Please Stand up? Those Safe Old Horse & Buggy Days? Not!!! On Saturday we had a little birthday party for my mother. Eighteen members of her family were there, including one son from Cranbrook, one from Calgary, a grandson for High River, and the rest of us from the Edmonton area. This gave us a chance to get caught up on the family news and my youngest brother showed us the photos he took last month in China. It was also the first chance in a long time to take photos of Mom with her five children. Mom was tired, as you can see in the photo. After an hour and a half she asked us to take her to her room. We love you Mom, thank you for being the wonderful person that you are!